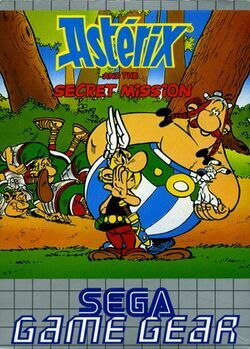 Asterix and the Secret Mission is the second of Sega's Asterix games. It was released for the Sega Master System in 1993, and there was also a lesser-known Sega Game Gear port. The Secret Mission handles scoring differently from the first game. Both Asterix and Obelix are playable; rather than the slightly differing levels of the previous game, this game features some entirely different segments or even levels depending on which character is used. The game supports one to two players; in two-player mode players take turns completing the levels. This page was last edited on 10 June 2018, at 21:00.